Take your chance to be a fashion producer. Turn your model into the next social media star! Choose one of these pretty girls and let’s start fashion makeover ASAP! It’s time to show your extraordinary talent and taste of fashion! This girl needs professional hairstyle! Wash hair with a shampoo, dry, comb tangled hair using various styling tools and cosmetics. Now choose an appropriate haircut. At your disposal is a wide selection of hair styles: long hair, short cuts, curly or straight hair. 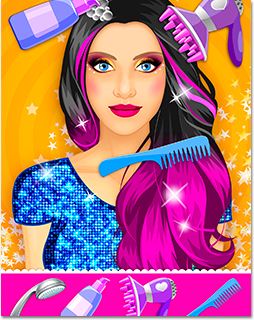 Dye your model’s hair. Go wild with crazy colors. How about blue hair? Create a unique style with awesome hair accessories for various occasions. Select from a huge collection of fab tiaras for a prom party, cute hair bands and cool hair clips for a romantic date or glamorous hats for a high fashion show. Wow! She looks dazzling! Your model needs a professional makeup to complete the look. Choose from tons of eye shadows, mascara, lipsticks and more! And don’t forget that glamorous accessories is a must have in this season! Shiny jewelry and animated tattoos will turn your model into a stylish celebrity! OMG! Now your model looks stunning! Compete against other models to win likes in social media. Vote for your extraordinary model. Stay in the competition as long as possible. 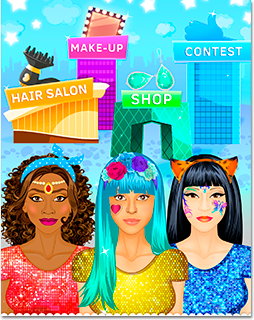 Use likes earned in the competition to buy exclusive accessories and cosmetics for your model. 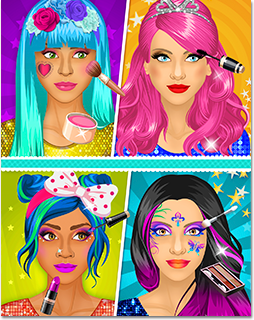 Buy looks and Pro makeup sets to be the hottest girl around! 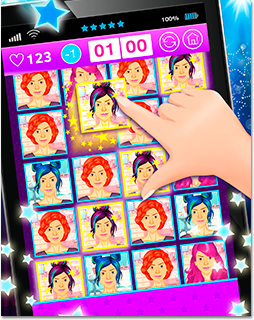 What can you do in this princess salon game? - Apply makeup in the Makeup Salon. 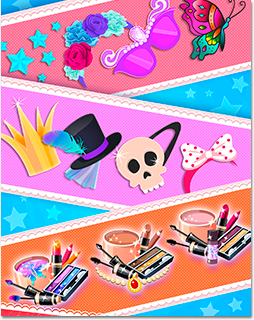 There you’ll find dozens of eye shadows, lipsticks, rouge and many more! - Celebrate Halloween in style! Try a witchy make-up and spooky accessories for Halloween makeover!